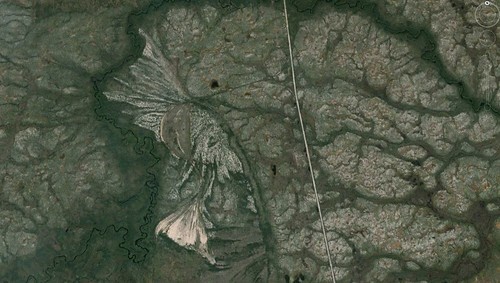 May 2015 – Where On Google Earth? 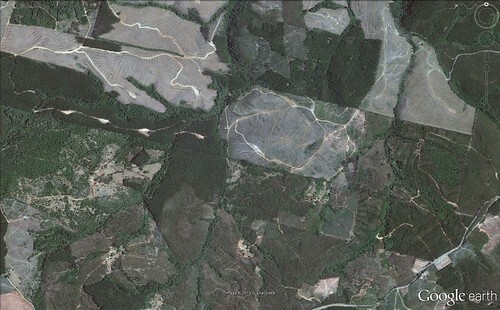 The last contest in this round of ten is #400 in the Where On Google Earth series. Thanks to all for the excellent submissions to date. If you haven’t submitted anything, there is still a bit of time to send in your suggestions for locations to use in this special contest via a comment on this post. The comment will remain hidden. Send us your latitude-longitude pair – include a hint as well as something explaining why you chose that location. We will accept entries (as many as you would like to offer) until the end of this contest (#398). At that time, we will choose the most interesting one to use for #400, and automatically award the two points for that contest to the person who supplies that entry (since we can assume you’ll know where it is when you see it before the hint)! There will, of course, also be credit given to person that supplies the winning contest. 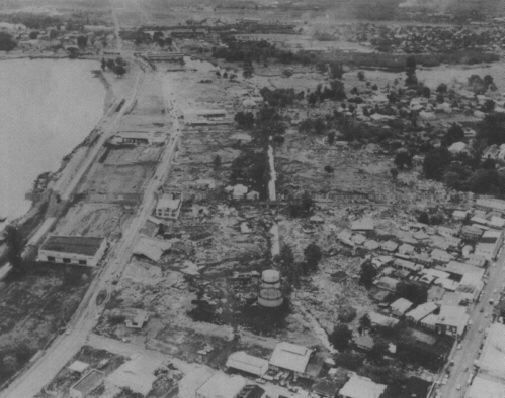 On May 22nd, 1960, at 3pm local time, the largest earthquake ever recorded by modern instruments was felt near Lumaco, Chile. 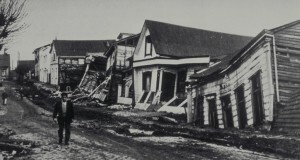 Registering at magnitude 9.5 on the Richter scale, the quake caused widespread damage locally, served as the focal start of a tsunami with waves up to 25M felt in areas of the Chilean coast. One set of 10M waves devistated Hilo, Hawaii, nearly 11,000 KM away, causing 61 deaths there, and a day later, northern Honshu, Japan, over 16,000 KM away, was hit with 5.5M waves that destroyed 1600 homes and killed 185 people. Estimates of the total loss of life range from about 1,500 to as many as 6,000. The quake caused a volcano, Cordón Caulle, to erupt with in a rhyodacitic fissure eruption. Some geologists have contended that the changes in the structure of the Nazca and South American plates caused by this earthquake were direct causes in the 2010 8.8 magnitude quake whose epicenter was 250 KM north of this spot, making that quake effectively an aftershock of the one 50 years before. Some geologists contend that the 2010 earthquake near here should be considered an aftershock of the one 50 years earlier. 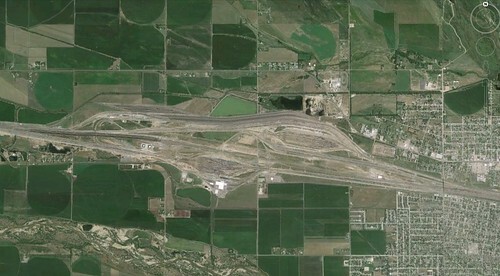 The Bailey Yards on the outskirts of North Platte, Nebraska is one of, if not, the largest railway yards in the world. With about 315 miles of individual track, it’s hard to imagine how much shunting of rail cars goes on in a relatively compact space. Over 300 miles of track and nearly 1000 switches here – lots of shunting going on! 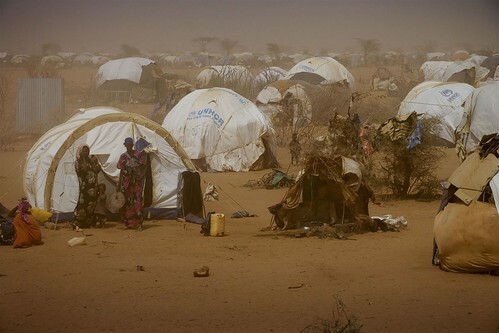 The Dagahaley refugee camp is one of 4 UNHCR refugee camps that surround the town of Dadaab in Kenya. Combined, these camps contain about 500,000 people that have fled the fighting in Somalia, with nearly 120,000 of them in the Dagahaley camp. These camps were formed in the early 1990s and are still growing. The situation is bad enough that I’m not going to trivialize it with a cute saying about those who found the site. Around 120,000 people with over 20 years of emergency temporary living.